Here is a great book to teach children about Evolution. 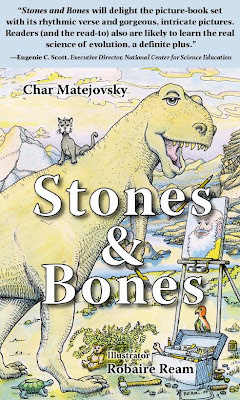 It is called Stones and Bones and written by Char Matejovsky. You can go to the Stones and Bones website for an interactive educational experience. We are teaching evolution as part of our church school curriculum. This could be a helpful resource. First Presbyterian Elizabethton signed on to celebrate Evolution Sunday for the third year in a row. Here is a list of around 500 scientists who are on call to be resources for congregations, educators, and ministers. You can read why Evolution Weekend is important for faith communities and why it is important for clergy to publicly state their support for science by reading about the clergy letter project. We already have over 255 congregations on board to participate in Evolution Weekend. If you haven’t yet signed up, please think about doing so. Remember that participation can take any form you like – from a sermon to a lunch discussion, from a children’s class to an adult education class. And please remember that the goal of Evolution Weekend is to elevate the quality of the dialogue about the compatibility of religion and science – we need to move beyond sound bytes to meaningful discussion. Finally, all states except Mississippi, Nebraska, Nevada and West Virginia, as well as the District of Columbia, are already represented. If you know people in the missing locations, please encourage them to sign up. Thanks very much for your continued support. Together we can demonstrate that religion and science need not be in conflict and that religious leaders and scientists can work productively together.